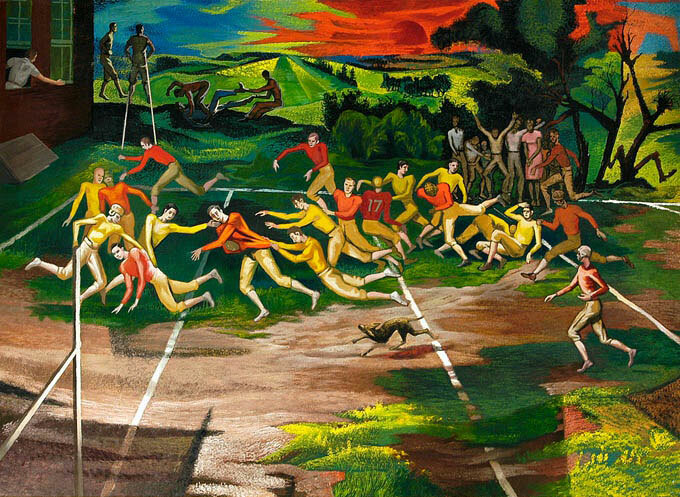 John McCrady has often been referred to as the most important New Orleans artist of the 1930s and 1940s. He was born in the rectory of a small Episcopal church in Canton, Mississippi where his father served as the minister. Due to this profession, the family lived in various rural areas throughout Mississippi and Louisiana during McCrady’s childhood. The senior McCrady was not only a theologian, but also a highly educated philosopher who taught his children the importance of both faith and independent thinking. In later years, McCrady often explored the relationship between God and Man through his art. In 1928, his father accepted a position as the head of the philosophy department at the University of Mississippi in Oxford. The following year, McCrady entered the university as a student, and spent the summers with his brother in Pennsylvania. While there, he visited Philadelphia art museums and encountered great works of art. Inspired, he informally took classes at the Pennsylvania Academy of the Fine Arts during the summers of 1931 and 1932, and soon decided to devote himself to becoming an artist. McCrady left the University of Mississippi, moved to New Orleans, and enrolled in the New Orleans Art School. After only one year at the school, McCrady won a scholarship to attend the Art Students League in New York. At the League he learned how to utilize color glazes with his oil paintings to obtain a richer, more precise color. His most influential teacher there was Kenneth Hayes Miller from whom he learned the importance of careful planning and organization of his canvases. In addition to learning the craft of painting in New York, McCrady also realized that he wanted to live and work in the South. He was very proud of his Southern heritage and depicted scenes of Southern life throughout his career. In 1934, McCrady returned to New Orleans and took employment with the Federal Art Project painting public murals. His big break came the following year when he participated in an exhibition at Philadelphia’s Boyer Galleries titled “Thirty-five Painters of the Deep South.” The show received rave reviews and the gallery offered McCrady a one-man exhibition in 1936. Shortly afterwards he was featured in articles in Newsweek, Time, and Life magazines. In 1939, he was awarded a Guggenheim Fellowship to document the faith and lives of African Americans in the South. As McCrady moved into his mature style he began to be associated with the Regionalist movement, an aspect of American Scene painting. The American Scene style was developed by American painters after World War I as a reaction against the excesses of European modern art. The artists’ reflected the isolationist attitude felt by many Americans during the post-war/Depression era. The Regionalists, in particular, focused on the distinctive attributes of their home states and regions. Their art was representational and often extolled traditional American values. McCrady became the most prominent Regionalist representing the Deep South. McCrady married Mary Basso (a former classmate from the New Orleans Art School) in 1938, and the couple had a daughter three years later. In 1942, he established the John McCrady Art School in the French Quarter in New Orleans, where his students included Ida Kohlmeyer. Throughout the fifties and sixties, McCrady focused on teaching at his school and writing about his artistic philosophies and techniques. His unique approach to painting with color glazes was featured in an article in American Artist in 1966. At the end of 1968, John McCrady unexpectedly passed away. A memorial exhibition was held the following year at the Downtown Gallery in New Orleans, and a major retrospective was organized by the New Orleans Museum of Art in 1975.